The Oklahoma Policy Institute, a think tank that provides insightful, independent analysis of state policy issues, is conducting a year-end fundraising drive. As political power shifts in state government next year, OK Policy is needed more than ever here. 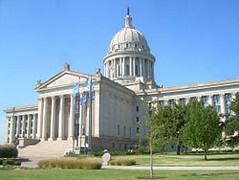 The organization has become a mainstay of Oklahoma politics, government and media since its inception. It adds balance and intellectualism to a state political climate often driven by ideology and short-term interests. With Oklahoma facing prolonged constraints on the budget; with funding cuts leading to a loss of services and programs that is eroding our ability to invest in our common goals as a state; with a fragile economy leaving families struggling to get by and get ahead, we believe that the need for OK Policy has never been greater. First-time contributions are matched by a foundation. Contributions are tax deductible. Click here to contribute. Speaking of mainstays in Oklahoma, The Oklahoma Observer continues to churn out progressive news and commentary in one of the most conservative states in the nation. The journal’s former editor, Frosty Troy, its current editor, Arnold Hamilton, and its contributing writers, offer a much-needed counterpoint to the state’s corporate media outlets, such as The Oklahoman. A subscription to The Observer makes a great holiday gift. Click here to find out more subscription information. « On Pushing The Unwilling, Or, Laughter: A Tool Of Asymmetric Warfare?